More than simply a laundry list of vulnerabilities, the CyberX Vulnerability Assessment report quantifies risk and includes mitigation recommendations, prioritized by risk. 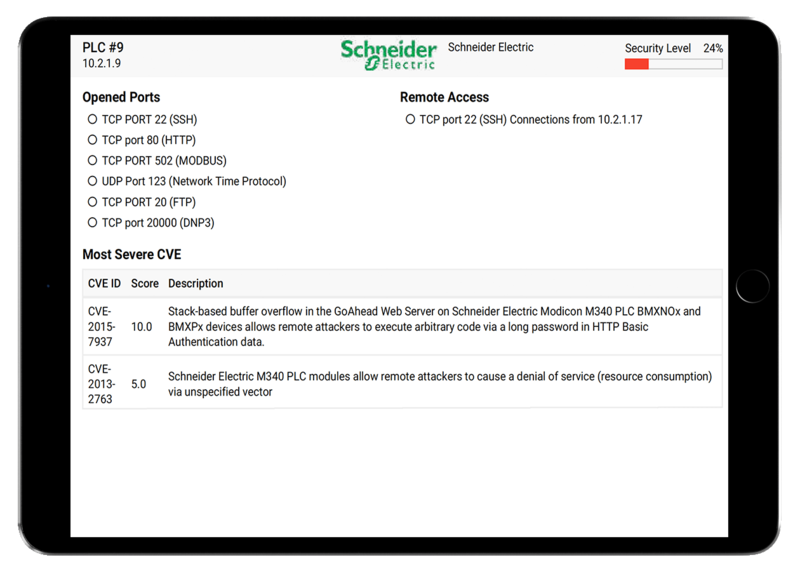 CyberX provides detailed information about each device including device type, manufacturer, open ports, and known vulnerabilities (CVEs) ranked by severity. As the most complete industrial cybersecurity platform, the CyberX platform is able to analyze any OT environment and return an objective risk score. That’s why CyberX’s Vulnerability Assessment report has quickly become the industry standard that boards of directors, internal auditors, regulators, and other overseers are looking for. Vulnerability assessment reports that simply return a “laundry list” of all possible vulnerabilities are neither practical nor actionable. But the CyberX Vulnerability Assessment report includes detailed and actionable mitigation recommendations at both the network and device layers, prioritized by risk — so you know what needs to be done now, and what can wait. Not only does this give you an immediate snapshot of your organization’s risk profile, it offers an objective measure of continuous improvement and ROI. Example of detailed mitigation recommendations provided by CyberX's VA report. Identifying all your OT assets and how they’re connected. Enumerating device-level vulnerabilities such as missing patches, weak passwords, unused open ports, remote access ports, etc. Reporting on network-level vulnerabilities such as unauthorized Internet connections, weak firewall rules, rogue subnet connections between IT and OT, unauthorized Wireless Access Points (WAPs), rogue devices, etc.